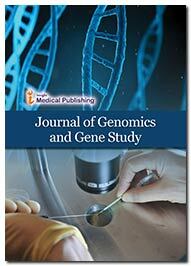 The Journal Genomics and Gene Study is one of the most interdisciplinary fields of science that study of the full genetic complement of an organism (genome). It employs recombinant DNA, DNA sequencing methods, and bioinformatics to sequence, assemble, and analyse the structure and function of genomes. Genetic engineering is the process by which scientists modify the genome of an organism. Creation of genetically modified organisms requires recombinant DNA. Recombinant DNA is a combination of DNA from different organisms or different locations in a given genome that would not normally be found in nature. In most cases, use of recombinant DNA means that you have added an extra gene to an organism to alter a trait or add a new trait. Some uses of genetic engineering include improving the nutritional quality of food, creating pest-resistant crops, and creating infection-resistant livestock. The journal defines genomics as "diagnosis, prognosis, prevention and/or treatment of disease and disorders of the mind and body, using approaches informed or enabled by knowledge of the genome and the molecules it encodes." Relevant and high-impact papers that encompass studies of individuals, families, or populations are considered for publication. An emphasis will include coupling detailed phenotype and genome sequencing information, both enabled by new technologies and informatics, to delineate the underlying aetiology of disease. Clinical recommendations and/or guidelines of how that data should be used in the clinical management of those patients in the study, and others, are also encouraged. The journal is committed to providing an efficient publishing service to the community. An expert Editorial Advisory Board, independent editors and a streamlined peer-review system enable rapid and fair decision making through to publication. The final manuscripts will also be enhanced by the editorial process making them attractive and accessible to the broad readership of the journal.